Allstate is aiming to encourage the next generation of women runners with a large donation. Over the past two months, the insurance company has donated $30,000 to Girls on the Run clubs across the country and sponsored more than 100 Girls on the Run girls and coaches to run in Allstate Hot Chocolate 15k/5k races. “We wanted to go the extra mile and continue our ongoing commitment to giving back to local communities while celebrating the accomplishments of those who have a passion for running,” Pam Hollander, vice president, consumer marketing at Allstate, tells Marketing Daily. Girls and women dominate the sport of running — 63% of runners are women, and on average, 59% of participants in road races are female, according to Running USA. The Allstate Hot Chocolate 15k/5k race series is one of the road races where a majority of the runners are female. Girls on the Run is a nonprofit physical activity-based development program for young girls that uses running to connect with and empower 8- to 13-year-old girls. The organization is “dedicated to creating a world where every girl knows and activates her limitless potential and is free to boldly pursue her dreams,” according to a spokesperson. 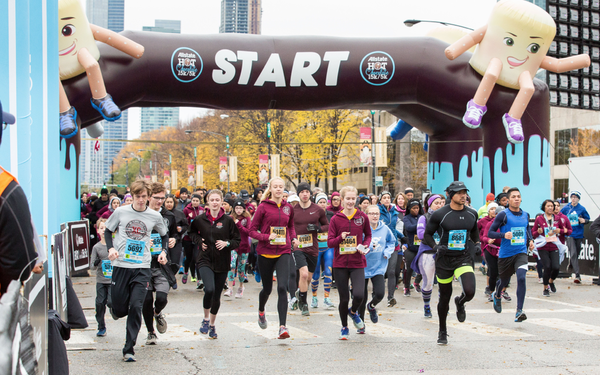 Alongside each of the recent Allstate Hot Chocolate 15k/5k races in Denver, Chicago, Columbus, Scottsdale, St. Louis and Tampa, Allstate offered local Girls on the Run girls and coaches free entry for the races and presented a $5,000 donation during the awards ceremonies following each race. Exact numbers vary by club, but each local Girls on the Run club benefitting from Allstate’s donations serves at least a few thousand local girls. Courtney Berg, executive director of Girls on the Run-St. Louis, shared that her club expects to serve 7,000 girls in the next year and that $5,000 can cover two full teams, “which makes a huge difference for the organization,” she says.